I am pretty happy with most of the tunes, but some of them still need work... to be honest! Attached is the first music-disk as well as the .SKS files if anyone wants to see just how bad my music conversion is! Also, I have attached the first few tunes I've done for disc 2. Now, most of these are unfinished or seriously need a lot of work, but you can see where I was going with them. The rest of the programming is very basic and clunky, but that's because my assember knowledge is very limited. Sorry about that. DISCLAIMER: These tunes were converted on WinAPE and so will sound different on a proper CPC or any other emulator. So, please view this on WinAPE 2.0 A17 with stereo audio to kinda hear what I'm hearing! I was wondering when you were going to upload these! Check these out everyone - they're tremendous! Just wondering - what are SKS files? Nice to hear the 'if only' Commando hi score music, and Portal! What a massive effort! Listening to it right now. You know, you can open sks songs in Arkos and make any corrections you need to do to make the songs work in a real CPC. I did that with DEVIATIONS on disc 1, but I found that channel 2 has a lot lower volume than 1 & 4; is this normal on a real CPC? It's been too long since I used one to remember. Emmm... there is only 3 channels. Am I missing something? Nice work. One question about the Fast_Textoutput on the Wiki. I notice it uses ADD HL, BC to add $800 to get to the next line in the software-character-output routines. Could you use the SET/RES trick here for a speed up? By my calculations 7 ADD HL, BC instructions take 77 cycles and 7 bytes. 7 SET or RES instructions would be 56 cycles but 14 bytes. Maybe I'm missing something (or I should just try it out, but my Windows machine is out of commission right now). That's quite odd... I have presented a few days ago your musicdisk to some guys at the Reset #0 meeting and they all wanted to know why you didn't spread it ! Well, now, that's done :-). We have listened your tunes on a real CPC with speaker, and they sound great ! Thanks guys! I nearly didn't post it on here today after downloading and watching the BATMAN FOREVER and MOODY demos, which are simply amazing! You guys are the reason I got into computers in the first place; I simply love watching demos! Batman forever misses as good as tunes imho. Wow! If you think it's good enough. Thanks! Incase you're interested, I've cobbled-up a quick PREVIEW of disc 2; meaning people can see what I've already done without having to mess about with STarkos/Arkos. It's attached below. EDIT: Oops! Does help if I attach the .dsk file! I remember picking up Chaos Engine II AGA (from a local party) and watching the Lightforce cracktro and being mesmerised by the music. It's one of those 25 second tunes that you find yourself listening to for 10 to 15 minutes straight. Wonderful tune. I hope the lack of drums doesn't spoil it too much. I think the raw music works as it is. I did not listen all of the songs (directly in arkos tracker, no cpc at work ), but they seem good! Too sad you did not release your music disc during the ReSeT Party http://www.pushnpop.net/reset/index.php?action=results to reach a broader audience. By the way, do not hesitate to write 100Hz song, you can reach better quality. I already hear comic bakery with AMC at 100Hz (by ELiot ?) years ago and it sounded very good. It's quite sad really, but every tune I've converted has a story behind it. For example; I was a HUGE fan of Robocod, so that's why I converted Richard's beautiful Catlots tune, the Skid Row cracktro tune (my all-time favourite, Synth Drum by Zzzzax) and the Legend trainer tune (Bad Moon by Damien)! I could go on, but I'll only bore you all! Not if you interleave the scan lines 0, 1, 3, 2, 6, 4, 5, 7 (or other possible combinations). It would most likely also be possible to fit all the characters into 32 byte boundaries and remove the requirement for an address lookup table. Ocean Loader rocks and this is a good conversion. Here's a quick version of OCEAN LOADER 3 by PETER CLARKE (copyright 1987 Ocean Software). It still needs a lot of work, but you can get the gist of how it will eventually sound. It's only 50hz for now as I wanted to get the tune structure right before fine-tuning things. Very nice compilation. I especially like the Robocod tune, and the Crystal Intro. 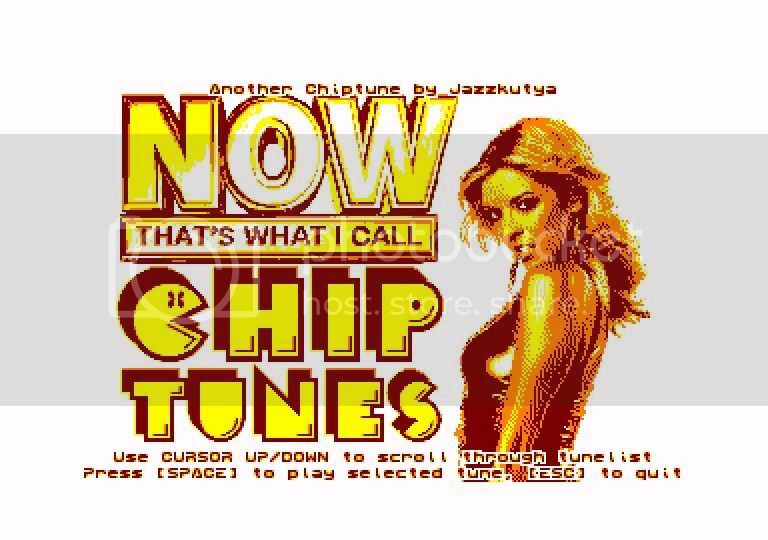 These tunes were converted on WinAPE and so will sound different on a proper CPC or any other emulator. So, please view this on WinAPE 2.0 A17 with stereo audio to kinda hear what I'm hearing! We can not go in that direction. It's easy to hear on a real CPC that the tracks aren't "compatible" with a real CPC. Either use an emulator with a more accurate AY-emulation, or use a real CPC. Imagine if the emulators had the colors wrong, and the graphics artist wrote "Well, these pictures I've done only looks right on WinAPE". What?? Not good enough, sorry. Otherwise the forum should have a completely new category called "CPC emulator only stuff". 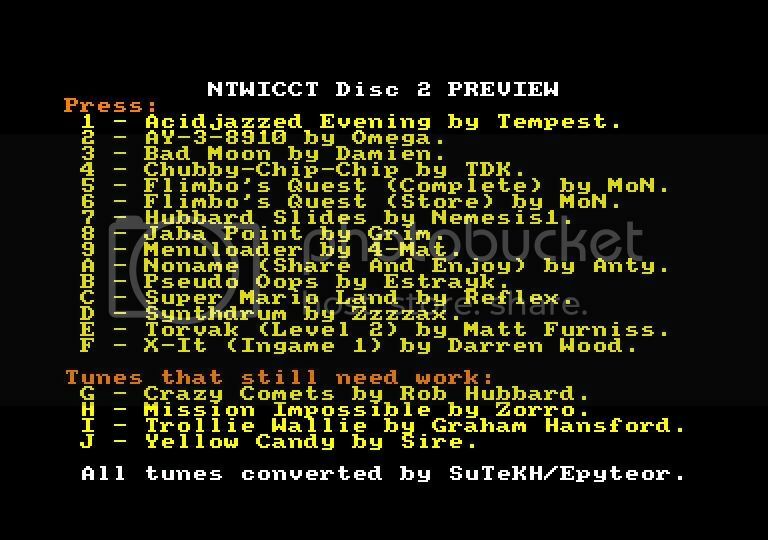 Amazing effort... can't wait for NTWICM 2 - The Flimbo music brought back some memories, used to play this for hours. Page created in 0.323 seconds with 104 queries.